These Nine Short Stories included in this bundle are perfect for your middle school classroom! Incorporating more short stories into your curriculum can result in higher student engagement, increased proficiency in citing and justifying textual evidence, and more complex analysis just to name a few! 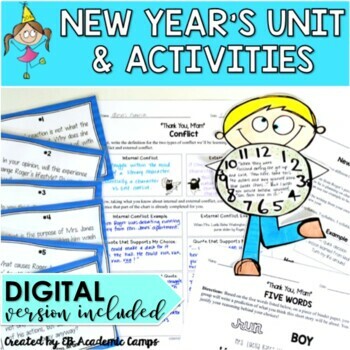 This New Year's Unit & Activities for Middle School and High School is the PERFECT and easiest way to bring in the New Year with your students! Activities include work with inference skills, logic, argumentation, critical analysis and thinking, characterization, theme, and point of view. - Teacher Notes: Key discussion points included to help you lead whole-class discussions and reading. - Five Words Preview Activity: In order to engage students in the reading of “Thank You, M’am,” you will be asking them to write their own anticipatory paragraph explaining what they believe the story will be about. - Types of Conflict Activity: Students will work with the two types of conflict and find evidence from the text to support and justify their reasoning. 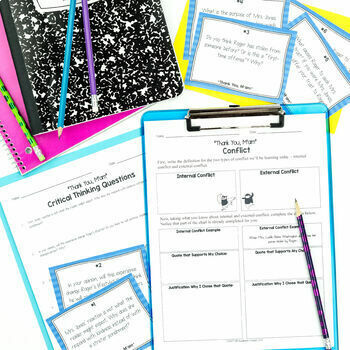 - 6 Critical Thinking Task Cards: Use these task cards to review, lead whole-group or small-group discussion, or a Socratic Seminar. All questions are thought-provoking and challenging. - New Year's Resolution Activity: Students will create their own New Year’s resolutions and will discuss how they are going to have a fresh start much in the same way Mrs. Jones gives Roger a fresh start, all while focusing on one theme from the short story. - Haiku Activity: Students write their own haikus from Roger's perspective, all relating to how they plan on making a change for the better in the new year. - Thank You Note Activity & Rubric: Students will write a thank you note from Roger’s point of view expressing his gratitude to Mrs. Jones for her kindness. - Essay Question & Rubric: Students will compose a response to literature focused on a challenging prompt that requires them to analyze the text in a deeper way. 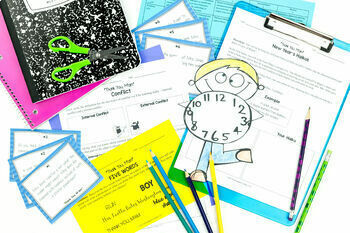 We've also included a complete essay graphic organizer for you as well. *PLEASE NOTE: Due to copyright law, we are unable to provide you with the complete text of this short story. Also, make sure to follow us to be notified when we upload new resources! We always do a special discount when we release a new resource, so it pays to follow us!